Wayne and Shuster met as high school students at Harbord Collegiate Institute in Toronto, Ontario, Canada in 1930. They both studied at the University of Toronto, where they wrote and performed for the theatre there, and in 1941 they made their radio debut on CFRB in their own show, The Wife Preservers in which they dispensed household hints in a humorous fashion. 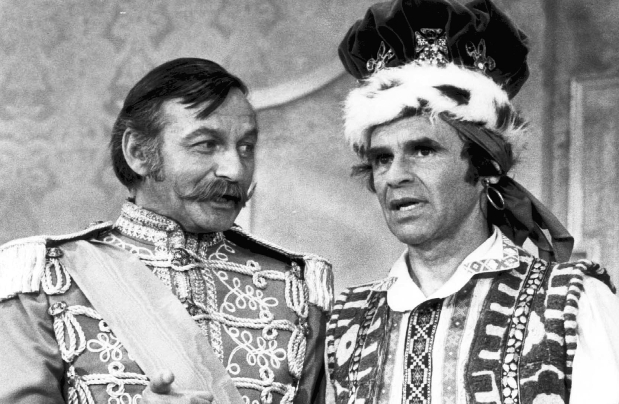 This exposure resulted in the pair being given their own comedy show on the Canadian Broadcasting Corporation’s Trans-Canada Network as Shuster & Wayne. They enlisted in the Canadian Army in 1942, and performed for the troops in Europe during World War II as part of the Army Show (they would also later perform for the army in the Korean War). They returned to Canada to create the Wayne and Shuster Show for CBC Radio in 1946. They first performed on The Ed Sullivan Show in the United States in 1958, and set a record there by appearing 67 times over the next 11 years. In 1965 The Wayne & Shuster Hour won the Silver Rose at the Rose d’Or Television Festival. 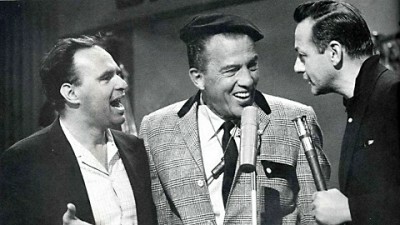 Wayne and Shuster were one of Ed Sullivan’s favourite comedy act — they appeared on the Ed Sullivan Show a record 67 times. In 1965, the duo made a series of six short documentaries about comedians such as W. C. Fields and the Marx Brothers, titled Wayne and Shuster Take an Affectionate Look At…, which were telecast on CBS in the summer of 1966. The programs were scored by the young composer “Johnny Williams”. This series, incidentally, was the last US network prime time series to premiere in black and white (at least until the 1991 CBS retro-spoof Morton & Hayes, which also included full-colour sequences). After having a weekly television series in the 1950s, they began a series of long-running, monthly Wayne & Shuster comedy specials on CBC Television in the early 1960s, which continued into the 1980s. They were an influence for later Canadian comedians, such as Lorne Michaels (Shuster’s son-in-law), the Royal Canadian Air Farce and The Kids in the Hall. In the late 1980s, many of their comedy skits were repackaged in half-hour chunks and syndicated around the world under the title Wayne & Shuster; the comedians filmed new introductions for the series. Wayne and Shuster from one of their skits. 1965. Wayne died in 1990. After his death the group received a special Gemini Award for their outstanding contribution to Canadian television. In 1996 Shuster accepted the Margaret Collier Award for the duo comedy writing and was later named to the Order of Canada. In 1999 Wayne and Shuster were inducted into Canada’s Walk of Fame . Having a history that dates back to their time at Harbord Collegiate Institute in 1930. Johnny Wayne and Frank Shuster were recognized with a Heritage Toronto plaque on April 27, 2012. Thanks for dropping by. Visit my other pages as well: Click on the following logos.